If you have been working for months trying to get higher search rankings with little to show for it, you are not alone. Chasing high rankings typically falls flat. You can easily spend six months or more — and a lot of money and effort — and achieve little. In this article, I will share four ways to increase sales from organic search traffic that don’t require high rankings. The example report below is from the new Google Search Console. The report compares performance for two periods: Nov. 2017 – Jan. 2018 and Nov. 2016 – Jan. 2017. The period with the most impressions (1.76 million) had a lower average position (22.4). The click-through rate (2.7 percent) was the same for both. Higher rankings did not produce more traffic, in other words. High rankings do not solely produce more traffic. In this report from the new Google Search Console comparing performance, the period with the lowest average search position (22.4) generated many more clicks (46.9K). Let’s break down revenue from organic traffic into basic components. Thus we have four ways to increase sales from organic search. Search Impressions. Increase number of pages indexed. Click-through Rate. 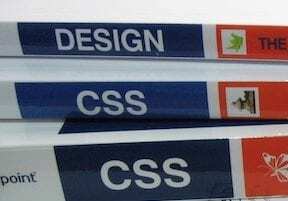 Create compelling search snippets. Sales Conversion Rate. Connect search snippet offer with page content. Average Order Value. Target high-spending buyers. Increasing the number of unique indexed pages can address weaknesses in organic traffic. As you get more valid pages indexed, you can generate more search impressions, which will result in more traffic if the click-through rate remains the same or similar. Higher click-through rates with the same or a similar number of impressions will also result in more traffic. In “How to Increase Click-throughs on Organic Search Listings,” my article last month, I provided examples and tips. Potential buyers read your search snippets to decide whether to click. Borrow ideas from your best-performing search ads — or your competitors’ ads — for search snippet ideas. The typical approach to increasing sales conversions is to optimize messaging on landing (product) pages and streamline the checkout process. However, an often-overlooked tactic is to filter the traffic, to increase its quality and relevance. To do this, review your organic search snippets and make sure the messaging reflects what the searcher will find on your page. Say you use rich snippets markup to display your product prices in search results, but the prices in your snippets are lower than what is on your site. Searchers would understandably feel like it was a bait and switch. Not only would they not make a purchase, but they would also likely lose trust in your entire site. A programming mistake or rapidly changing prices could cause inconsistencies, which generate distrust and lower conversion rates. 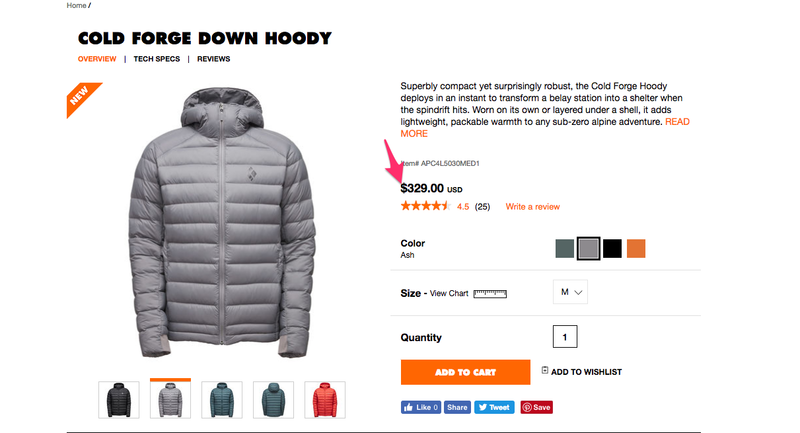 That is what apparently occurred with Black Diamond Equipment’s “Cold Forge Down Hoody.” The rich snippet included a price of $299. But the product page on Black Diamond’s website showed $329. 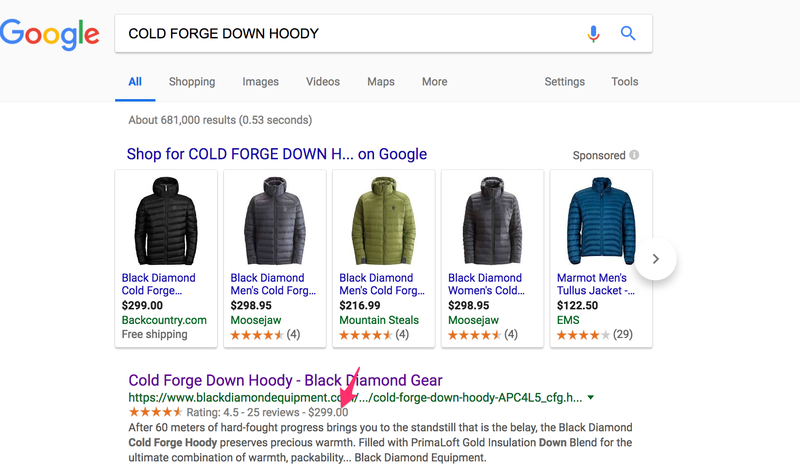 The price for this “Cold Forge Down Hoody” was $30 higher than on the search snippet. Another example of inconsistent messaging is with a minimum order threshold. If a product has a minimum order, disclose it in the search snippet, not after the searcher lands on your website. A final tactic to increase revenue from organic traffic is to increase the size of each order. 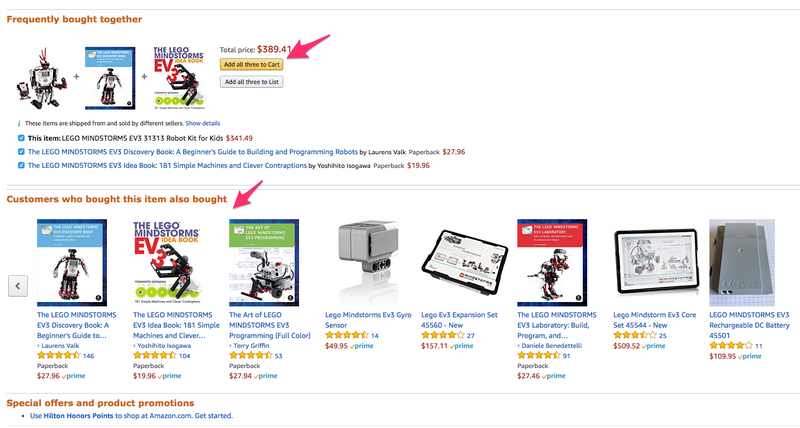 Amazon does this by recommending complementary items in the product pages and during the checkout process. Amazon recommends complementary products to increase order size. This technique works for visitors already on your site. But how can you attract larger orders from search results?